What it is, is a cool shower on a hot day, the crisp lettuce in your burger or the lush, tree-lined street that you find to walk down amidst an urban jungle. It’s a welcome contrast to the richness of the season, will take up space on your plate (and in your stomach), and tickle that part of your palate/brain/psyche that doesn’t usually get a lot of action at Christmas dinner. Also, it’s made of Brussels sprouts. I can see the logic in avoiding lettuce-y salads sometimes at holiday feasts. 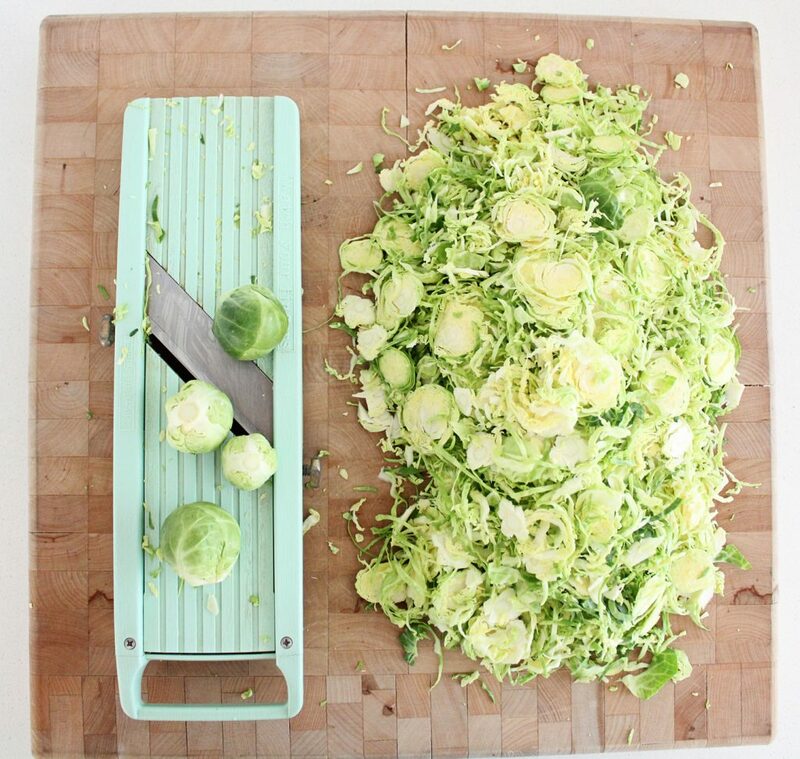 When salad gets plastered under a pile of hot mashed potatoes it loses its cool pretty fast, whereas Brussels are like ‘we’re still here but now we’re lightly steamed!’. It totally works. There is inherently a lot of cooked food at Holiday meals, which makes sense considering it’s winter and on the cool side (on this side of the world, anyway). 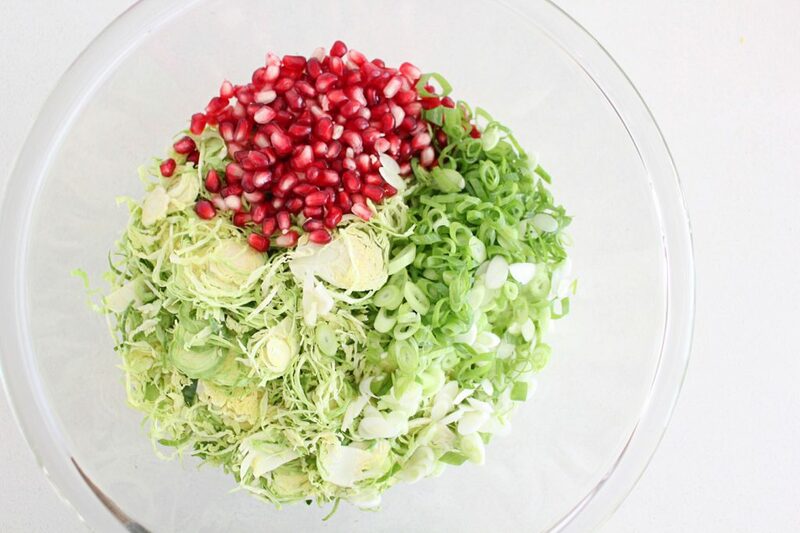 It is nice to have a fresh, bright, raw alternative to help rev up our digestion and contrast everything else. It will make your Creamy Swiss Chard and Sweet Potato Gratin that more rich-tasting and cleanse your palate between bites of our deeply herb-y Holiday Lentil and Buckwheat loaf. 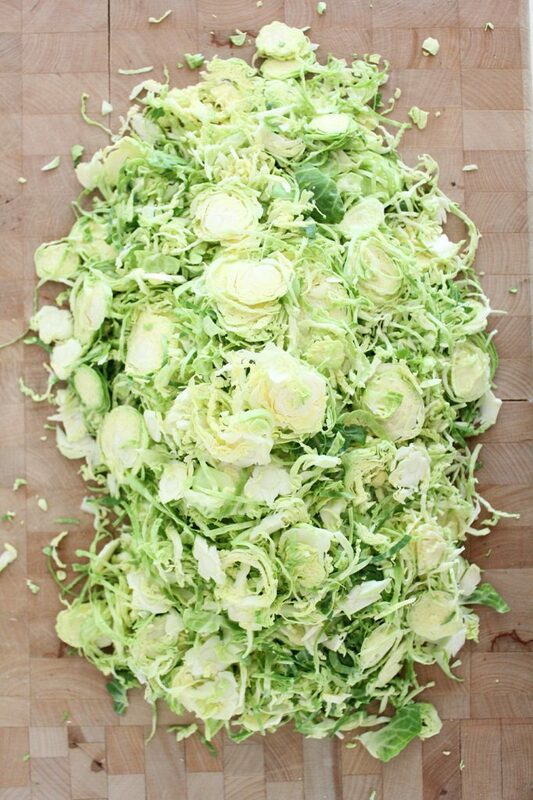 We have been eating a lot of this salad already this season, it’s my newest go-to salad. 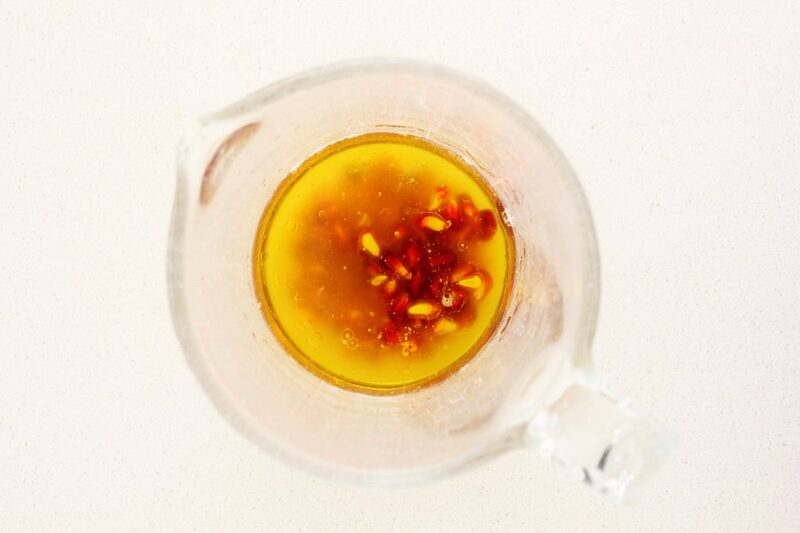 In part because it has been extra chilly outside so I’ve been cooking more warming foods that need a lively contrast. 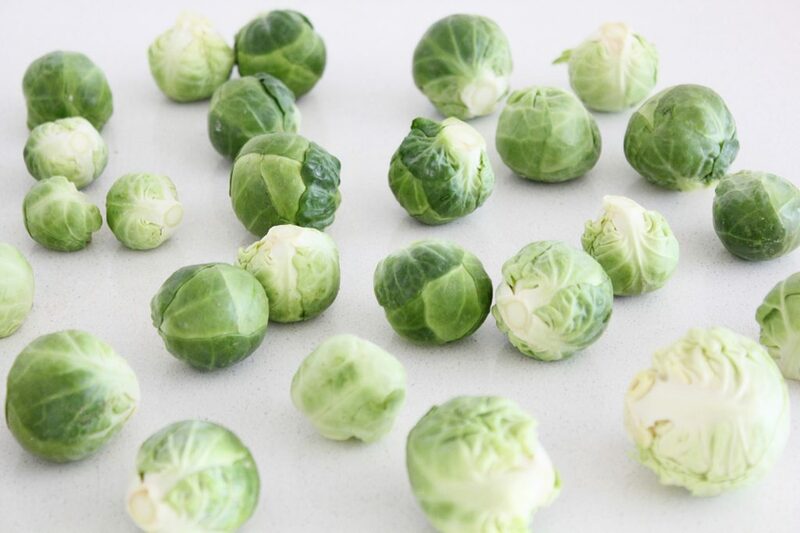 And also because I’ve been really busy and finding it hard to keep fresh greens in the fridge, and Brussels are super patient little guys (so is Sauerkraut, by the way, my other savior when I find the inside of my fridge looking like nobody’s home). 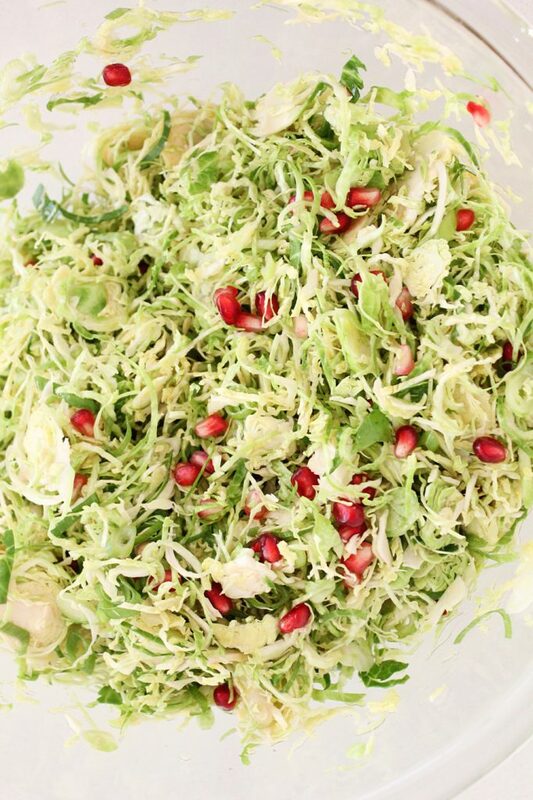 The base of the sprouts and the green onions with the straight forward dressing is steady. 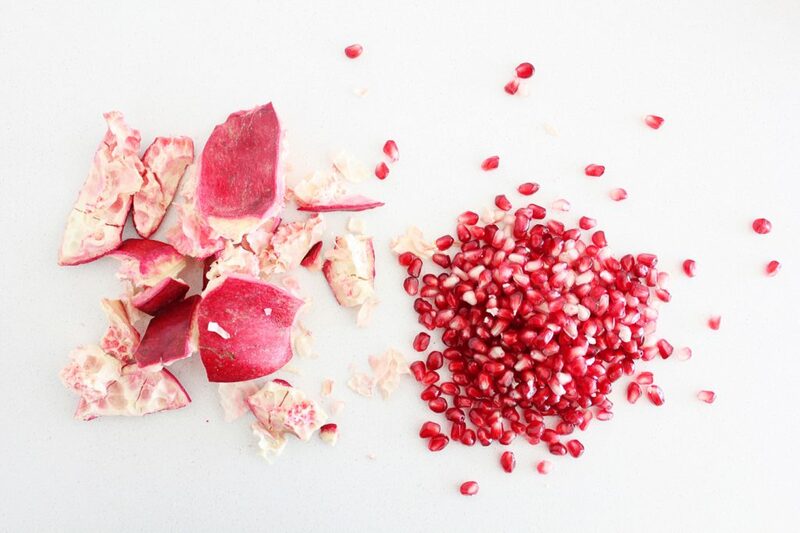 The addition of pomegranate seeds gives it a festive, decorative feel (and a really nice sweet, punchy alternative to the dried cranberries that seem to be in all salads everywhere all of the time). I’ve also made it with lots of pecans, which make it more filling if it’s not part of a rich meal, and also takes it in a more keto-centric direction. Avocado makes a nice addition too. 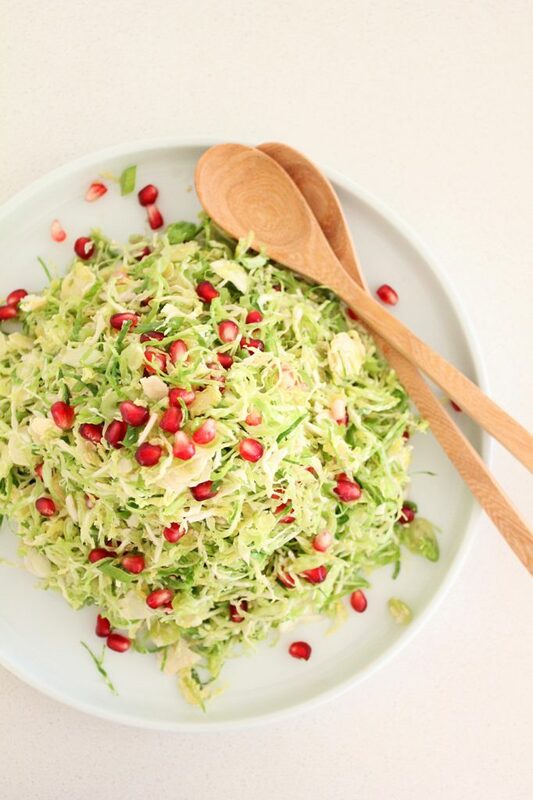 There is something about the soft, bland innocence of an avocado contrasted with slightly bitter, fibrous cruciferous veggies (and possibly the sweetness of the pomegranates) that is just so comfortably balanced. Grated Carrots are another beta-carotene-rich addition. Something worth mentioning is if you get gas or have a hard time digesting raw crucifers, you can also lightly steam the shaved sprouts (I just put them in a large frying ban with a splash of water and put the lid on top as the steam, toss around once in a while until they get bright green and then spread them out on a platter so that they cool off quickly and don’t overcook). Cool them down completely and then make the salad as directed. 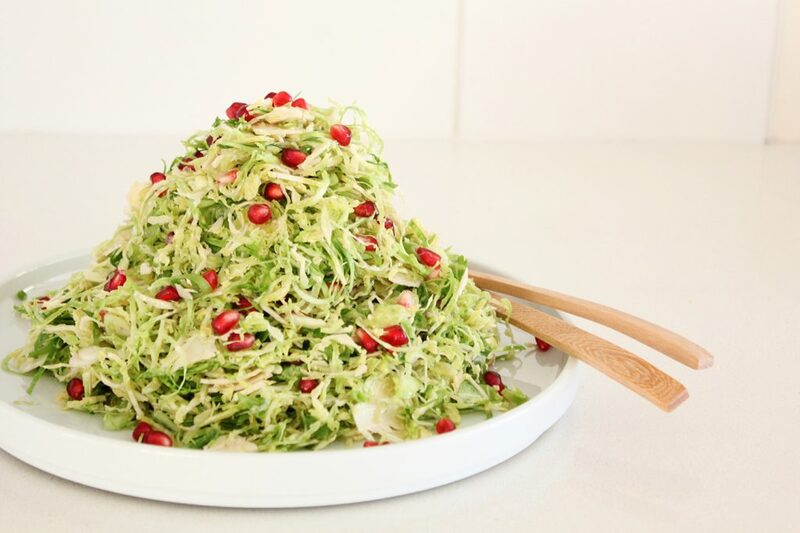 This may be TMI but cooked sprouts do a bigger number on my insides than raw for some reason, so you may want to try it out first. Possibly the best news? It still tastes great on day two and three and turns a leftovers sandwich (or collard greens wrap) into a fresh and crunchy reason to celebrate. 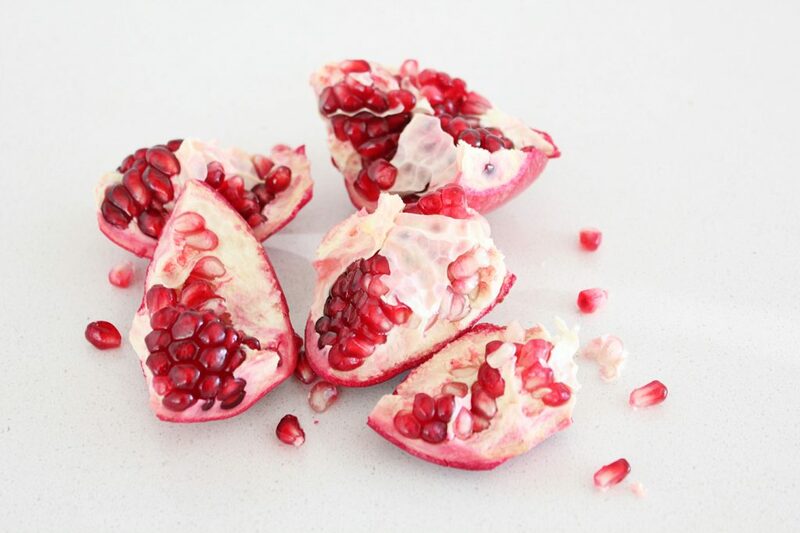 Combine all ingredients and using a fork, squish the pomegranate seeds against the side of the bowl to release some of their juices.